On 21 July 1932, the Hudson factory in Detroit unveiled a new make of car and this festive occasion was given a great deal of publicity. Amilia Earhart, the first woman to fly across the Atlantic on her own christened the Essex-Terraplane by smashing a bottle of aircraft fuel on its radiator grille. All the American Hudson dealers had come to the factory to personally receive their demonstration model. On that day a cavalcade of over 2,000 new cars drove through Detroit. Ford had hit the headlines a few months before with its new, cheap V8 and Hudson could therefore do with a little publicity. 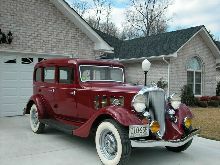 The Terraplane was the successor the Essex and was therefore first sold as the Essex-Terraplane. The model was slightly cheaper than the new Ford and the six-cylinder engine delivered 5 bhp more than the competitor's V8. In 1933, the car could also be supplied with an eight-in-line Hudson engine. It was the last model to be sold as an Essex-Terraplane. The name Essex disappeared for good. The eight-cylinder engine was only built into the 1933 Terraplane. After all, there had to be a difference between the expensive Hudson and the cheaper Terraplane. In the latter's case the customer would have to make do with a six-cylinder engine. By this time, the make was so popular that this was even detrimental to Hudson. In 1938, the Hudson board of directors decided to change the make's name to Hudson-Terraplane and in 1939 the word Terraplane disappeared. Whether this improved Hudson's sales? Definitely not. In 1936, the company still sold 123,266 Hudsons and Terraplanes. In 1937 and 1938 that number had decreased to 111,342 and 51,078 Hudson-Terraplances respectively. In 1939, only 82,161 Hudsons could to sold.